From Haines Junction, continue north on the Alaska Highway for 10.5 km. Take the left immediately before the Bear Creek Lodge. Note that there is a Kluane National Park sign 2 km before this turnoff that mentions the Alsek Trail. 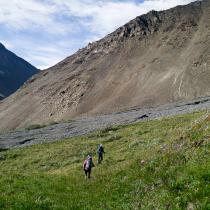 Follow this road for about 750 m until you reach a large parking area and some Parks Canada signage for the Alsek Trail. If you have a 4x4 vehicle with high clearance and the water levels aren't high, you may be able to continue past this point. There is often a large puddle at the beginning, followed by a potential creek crossing further up the road. Verify water depths before attempting to cross with your vehicle. If you pass these obstacles, you should be able to drive all the way to the cliffs at Thunderegg Creek. Driving to Thunderegg Creek will save you 13.4 kilometers (200 meters of elevation gain) return trip (about 3 hours), making this a 12 hour (15.6 kilometer) return hike. 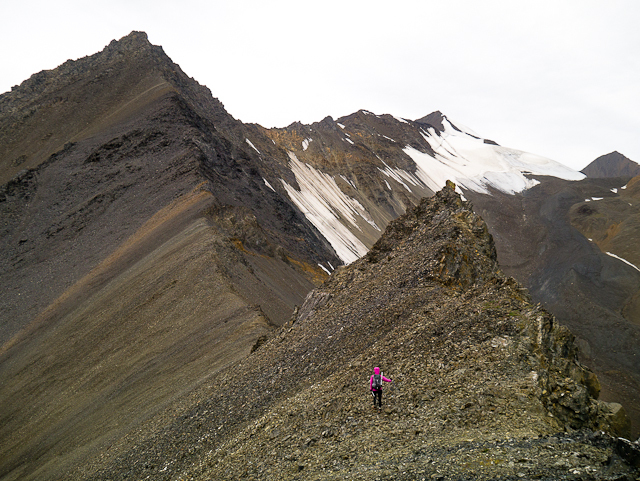 Notes: In the summer, when there is no snow on the ridge, this is classified as a hike. 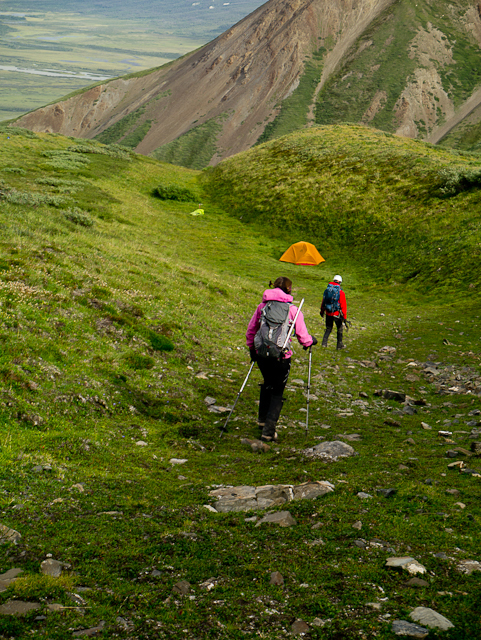 It is a long hike, and it is recommended that you spend the night in the alpine. 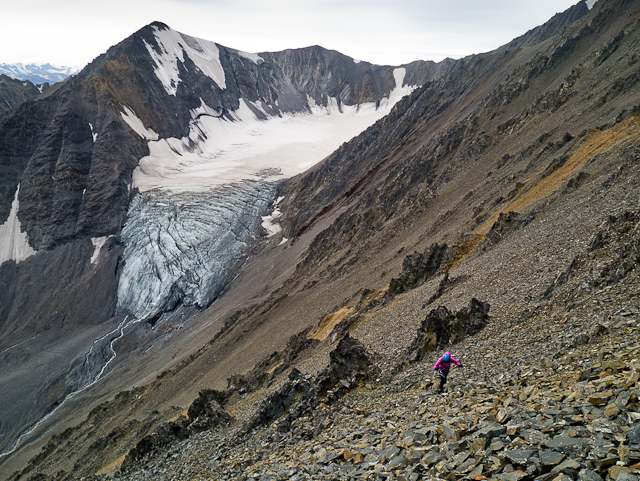 If you want to try to hike this in one day, it is recommended that you bring a bivy and warm clothes in case you are forced to spend the night. 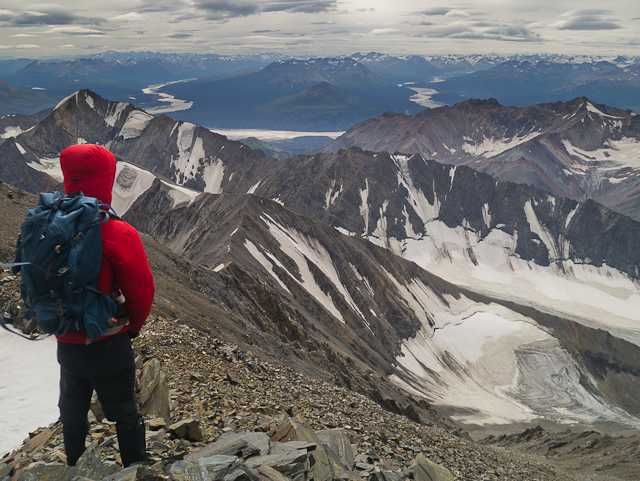 If there is snow covering the ridge, this would be more of a climb than a hike, and would require crampons, axe, and rope. If there is a lot of snow, you could ski large sections of this route. You can even ascend via the snow slopes on the east face below the summit, avoiding most of the ridge altogether. 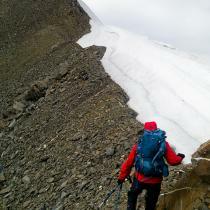 The east face is glaciated, with crevasses and a bergschrund, so practice safe glacier travel on this terrain. The route described here is for the southeast ridge. This is an interesting hike that leads to the summit. For the walk or drive up to the cliffs at Thunderegg Creek, follow the Thunderegg Creek directions. This is the black line in the map above and is 6.7 kilometers. From the cliffs at Thunderegg Creek, you have 2 options, depending on the time of year. If the creek is frozen (early Spring) or relatively dry (late Autumn), then you can descend down to the creek bed and follow it upstream to the dry stream bed that leads to the alpine (more on this below). Following the creek bed would eliminate most, if not all, of the bushwhacking. Do not attempt to follow the creek if it is running. Not far up the creek there is a narrow choke that is impassable if water levels are even slightly up. 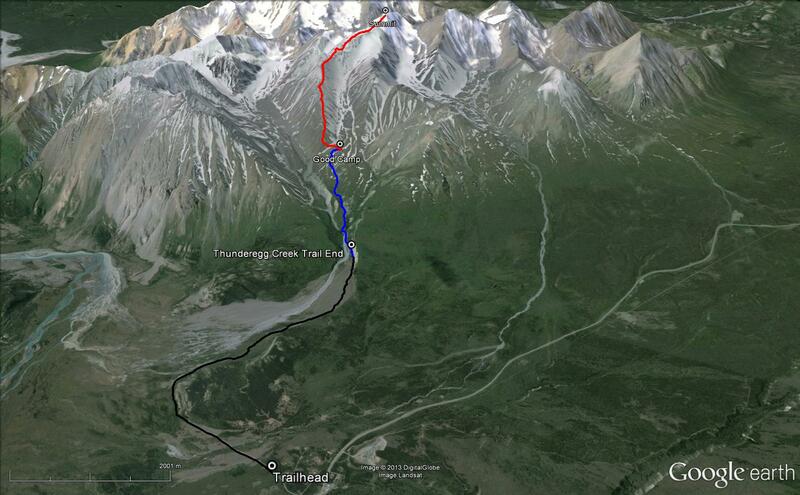 If Thunderegg Creek is running, then you have to reach the dry stream bed by bushwhacking to it (this is the blue line in the map above, and is 3 kilometers one way). 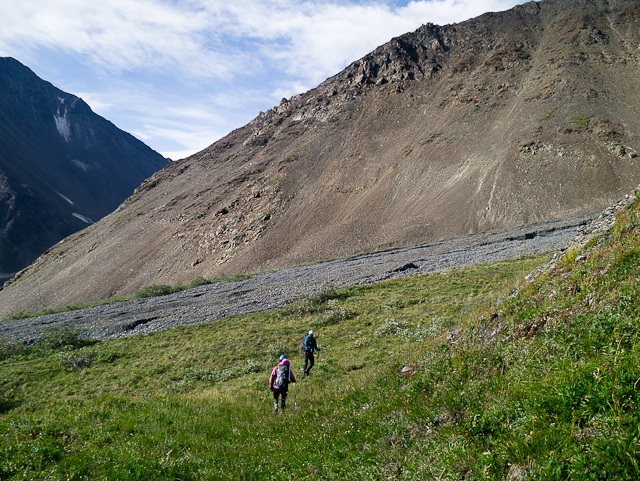 Continue following the ATV trail past the cliffs at Thunderegg Creek. 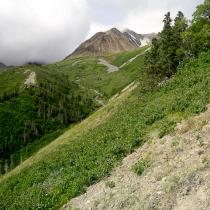 The ATV trail eventually turns into a walking trail, with minimal amount of bushwhacking. The trail ends after approximately 600 meters at a small fire pit with a grill. There is a small stream just ahead, through the bushes. This is where the serious bushwhacking starts in earnest, but shouldn't last more than an hour. Cross the small stream by stepping on any trees that span across it. There will be a hill in front of you at this point. 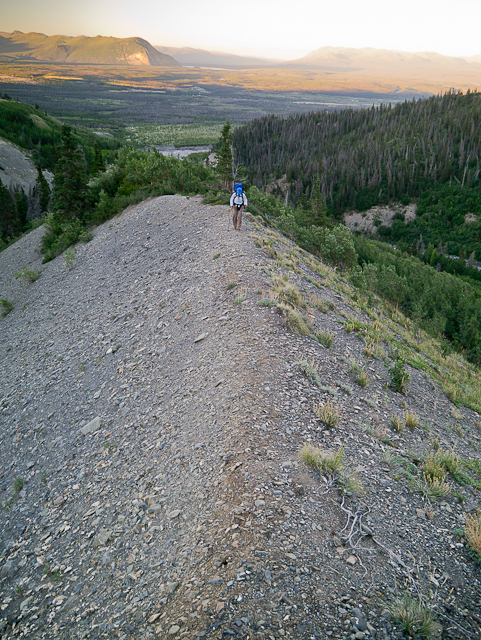 Start bushwhacking upwards and slightly to your left (stay on the Thunderegg Creek side of the hill). You are aiming to get diagonally to the top of this hill, but not right away. 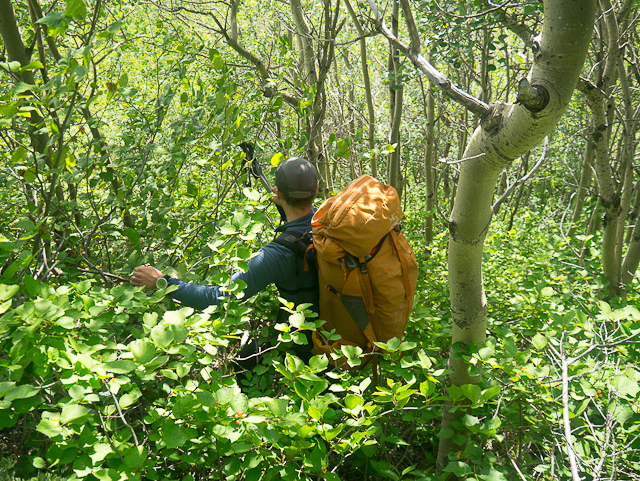 Once you reach the top of the hill, there is some more bushwhacking, but you may find reprieve on the right (north), steeper side of the ridge if you find the animal trail. 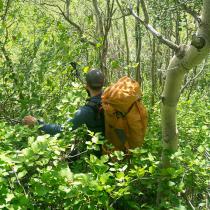 Either way, continue up the ridge until you leave the bushes and can see above you again. From near the top of this ridge where the bushes start again, you want to descend to the dry stream bed. 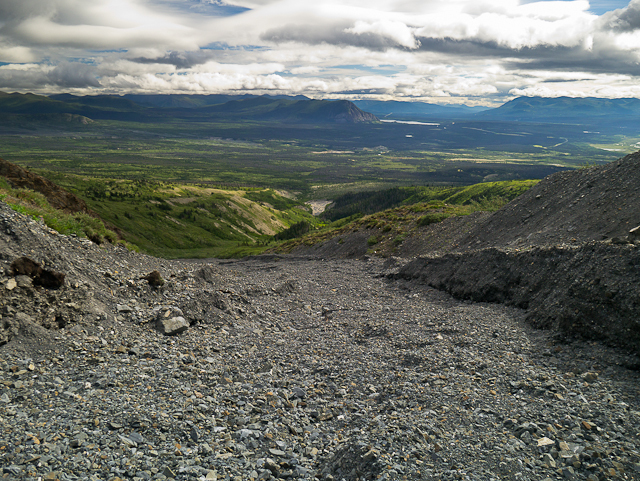 You should be able to see the stream bed meandering up into the alpine. 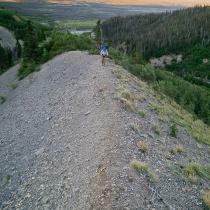 Descend from the ridge to a point where you can see the dry stream bed. Don't worry if you have to bushwhack for a few meters up the stream bed, as it is much easier than what you just came through. It will soon open up into a wide, gravel creek bed. Follow the dry creek bed all the way up into the alpine. If you are spending a night or two (recommended) up here, there are plenty of good camping spots up in the alpine at the top of the dry stream bed. Water is available a short walk to the north, where you can descend the moraine to a stream. 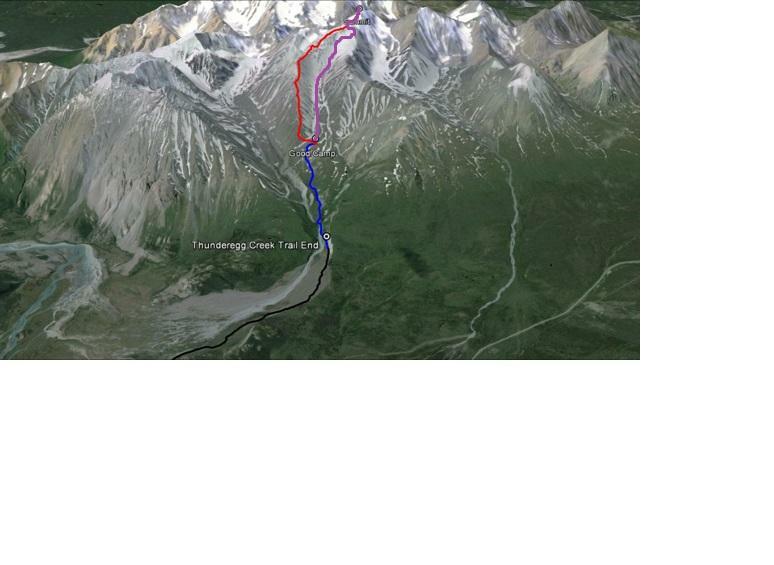 Now you have to gain access to the southeast ridge (this is the red line in the map above and is 4.8 kilometers one way). Do this by scrambling up the slope closest to you, facing the highway. 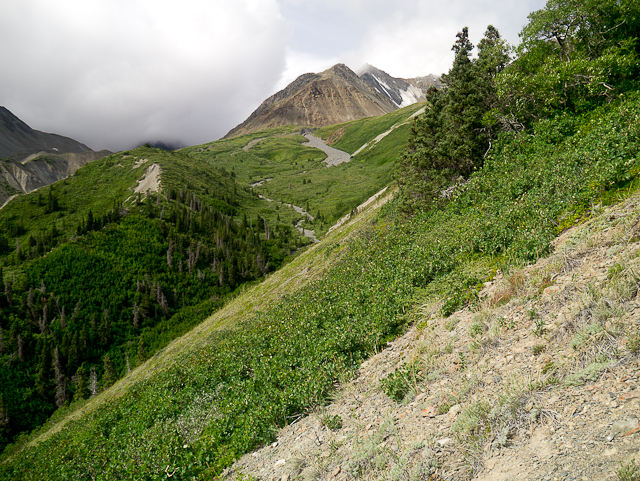 It will look steep because you will be looking at it straight on, but it is not as steep as it looks. Pick your way up to the top of ridge, all routes end up at the same point. 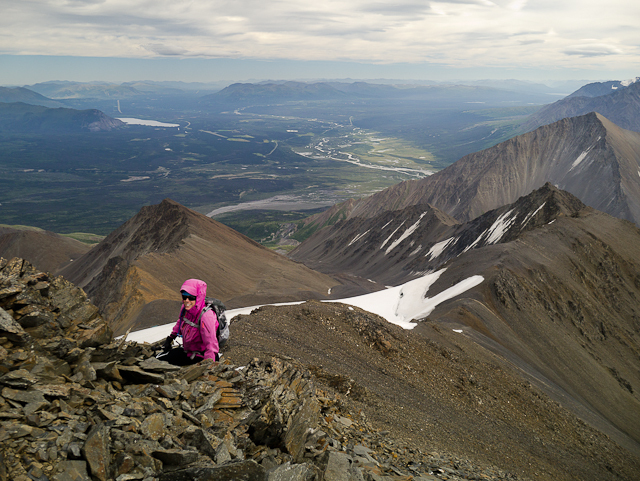 Once you gain the top of the ridge, it widens out for the first part and is an easy walk. You will be sticking to the left (south and west) side of the ridge most of the way, as it is a much gentler slope than the right side. Unfortunately, it is often the windy side of the ridge. Be prepared for high winds for most of the route. The ridge is straight forward and easy walking up until the large sub peak, which is where the ridge turns slightly more to the north (right). You will have to go up and over the sub peak, which will involve a very short section of Class 3 or 4 scrambling. Climbing up this is the most exposed part of the route, but once you climb over the sub peak, it is less exposed on the other side. Descending this part is more difficult than ascending it. You might opt to bring a rope for this section, although there isn't much natural protection around to anchor to. 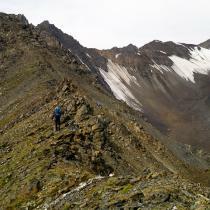 After the sub peak, you will be side-hilling and scrambling along the ridge, trying to avoid most of the ups and downs. You may be required to use your hands. 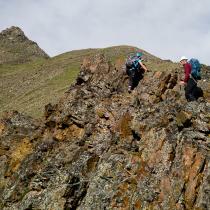 This Class 2 or 3 scrambling continues for a while until you reach a rounded shoulder before the main summit pyramid. 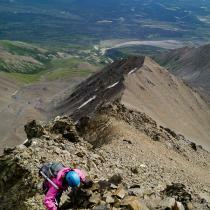 The summit pyramid is now an easy scramble to the top. There is a glacier on the northeast side of the ridge, so continue sticking to the left side of it as you make your way up to the summit. 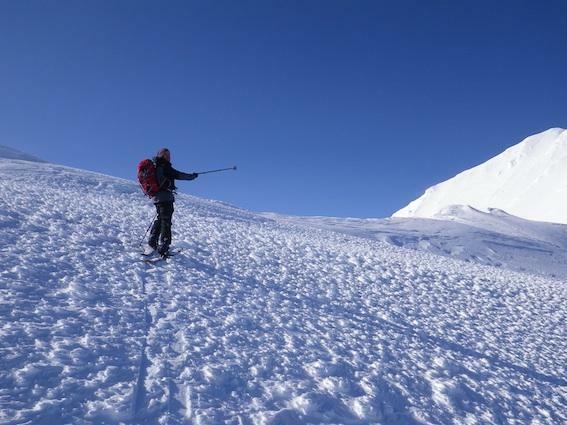 At the top, you can continue for a few more meters to reach the true summit. The views from the summit are incredible. There are many glaciers in the valleys below you. 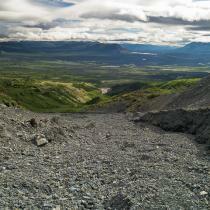 To the southwest is the Alsek River and Dusty River, meandering through the mountains. Directly west is the Kaskawulsh Glacier. 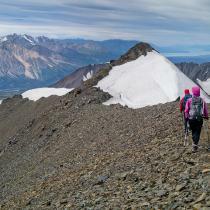 You can see further west into the Kluane Icefields, including Mount Logan. 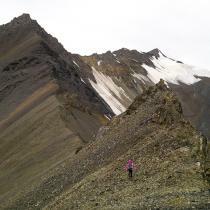 On the way down, you can try to descend by one of the scree slopes rather than hiking back all the way along the ridge. 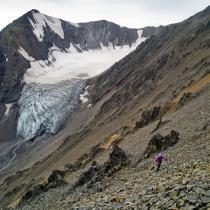 This may not save you much time, as the scree slopes are steep and send rocks tumbling down everywhere. 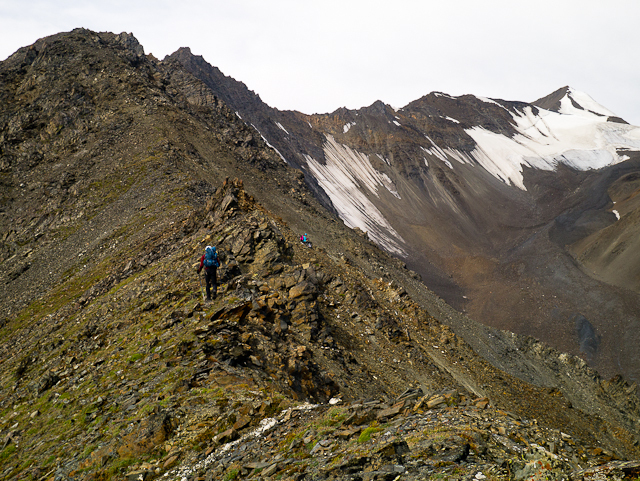 If you want to descend one of the scree slopes, wait until after you are back down from the sub peak, as the slopes are very steep up higher along the ridge. Be aware of potential changes in creek levels on your way down. 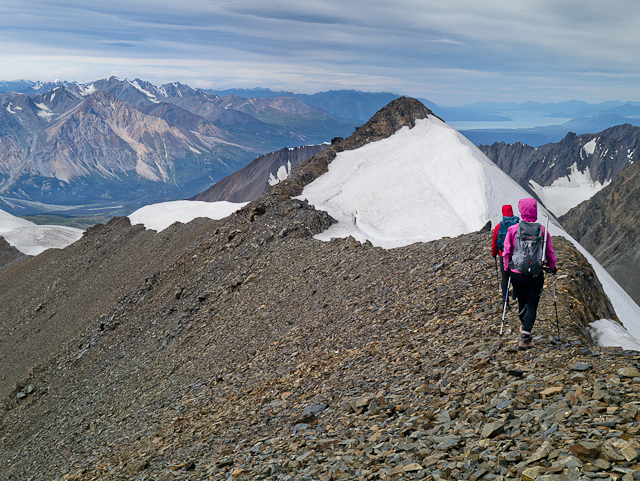 Have you been to Mount Archibald lately? A buddy and I did this, this weekend. (july 8-9) The drive in was interesting as the rain turned the road into a creek for at least a km. On the way out it was wet but not running. We hiked to alpine spent the night, woke up early then did the ridge. 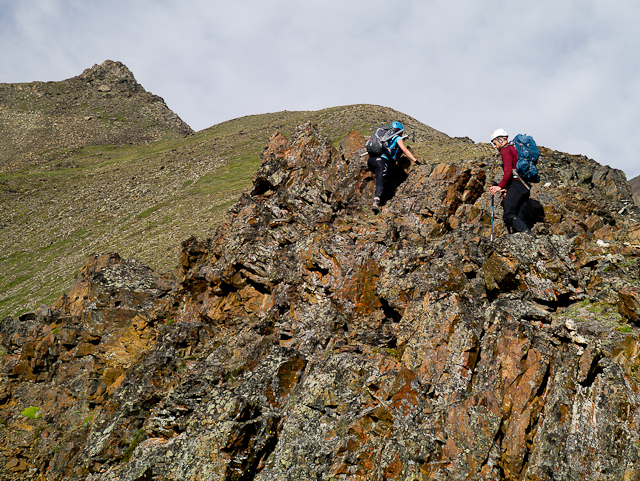 Once up and over the described sub peak we followed the ridge until the last sub peak before the summit pyramid. 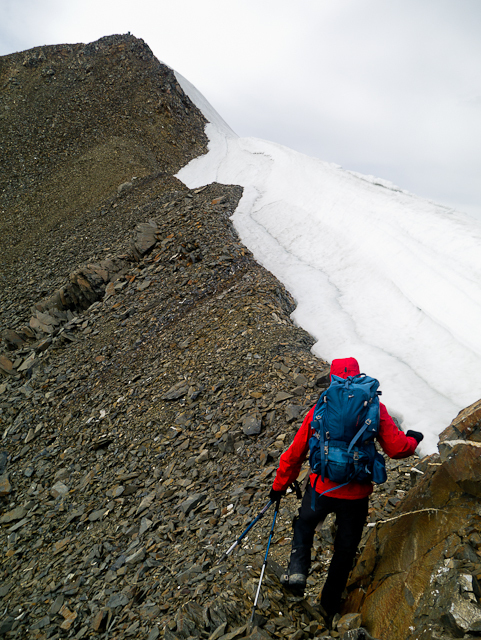 We opted to drop down to climbers right and put on the crampons to cross a snow slope to avoid more talus side hilling. We gained the ridge again and continued onto the summit pyramid. The summit pyramid still had lots of snow so we opted to put on the crampons again and short roped the last bit to the top. It was cloudy and windy but amazing! On the way down we followed the ridge to a snow ramp (Verenas route?) 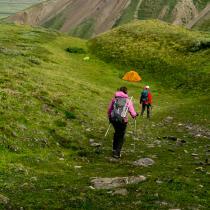 and dropped down to the valley, folowing it all the way to camp, then down to our truck at thunderegg creek. Someone has marked the bushwack by cutting bark off trees. It was helpful on the way down. (Thanks!) An amazing adventure. 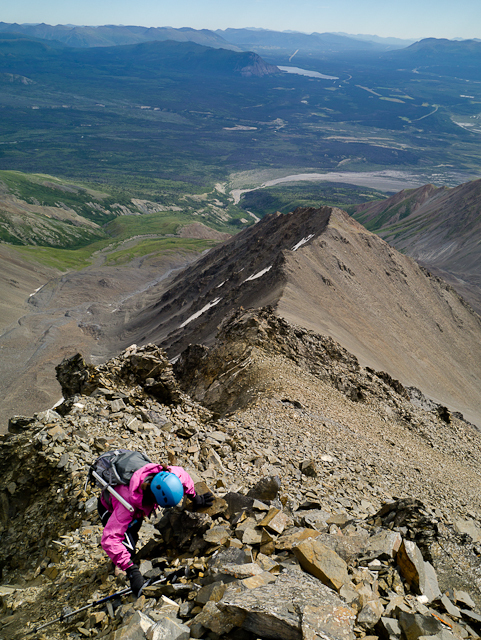 Basically following the route that Verena describes below (thanks, Verena), we got to the saddle just below the summit pyramid, left skis+board and booted up to the summit. 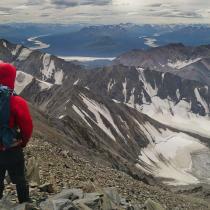 Views to Mt Kennedy and Mt Logan were phenomenal. Watch out for barely buried rocks on the way down. 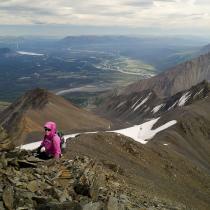 We tried climbing Mount Archibald last weekend. We intended on skiing most of the way from the highway up into the alpine. However, with such low snow levels and above freezing temperatures, there was almost no snow at lower elevations. 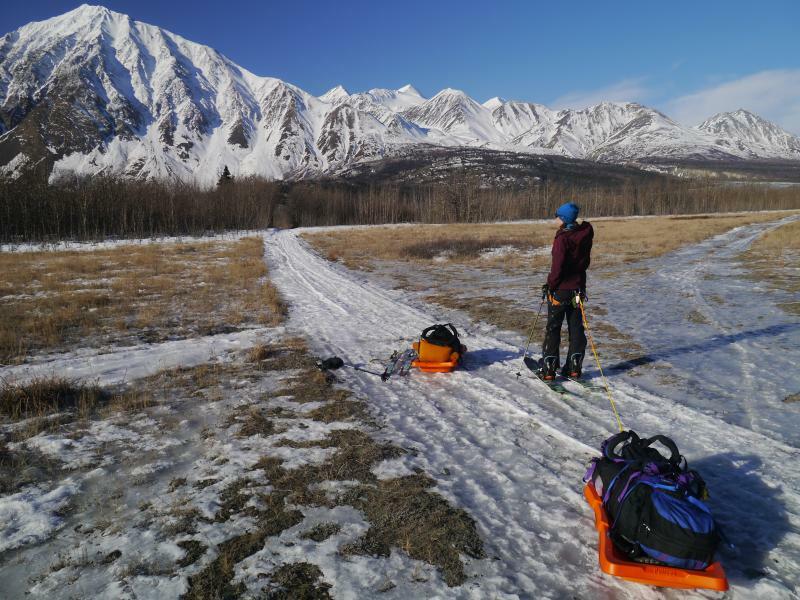 We carried our skis on our backs to Thunderegg Creek. Skiing up the creek was a challenge since the creek was open and flowing. Up high, the snow was hard and icy. We setup camp in the alpine, knowing we wouldn't be climbing the mountain the next day. We ventured up the moraines the next day, and the spindrift coming off of the summit reinforced our decision not to climb this time. Anyone (experienced hiker/climber) would like to ascent the summit this upcoming weekend (June 28-29) ?